Not to be confused with Claustrum. "Beestings" redirects here. It is not to be confused with Bee sting. On the left is milk expressed on day 4 of lactation, and on the right is breastmilk expressed on day 8. Colostrum gives the milk a yellow hue. Colostrum (known colloquially as beestings, bisnings or first milk) is the first form of milk produced by the mammary glands of mammals (including many humans) immediately following delivery of the newborn. Most species will generate colostrum just prior to giving birth. Colostrum contains antibodies to protect the newborn against disease. In general, protein concentration in colostrum is substantially higher than in milk. Fat concentration is substantially higher in colostrum than in milk in some species, e.g. sheep and horses, but lower in colostrum than in milk in some other species, e.g. camels and humans. In swine, fat concentration of milk at 48 to 72 hours postpartum may be higher than in colostrum or in late-lactation milk. Fat concentration in bovine colostrum is extremely variable. Newborns have very immature and small digestive systems, and colostrum delivers its nutrients in a very concentrated low-volume form. It has a mild laxative effect, encouraging the passing of the baby's first stool, which is called meconium. This clears excess bilirubin, a waste-product of dead red blood cells, which is produced in large quantities at birth due to blood volume reduction from the infant's body and helps prevent jaundice. Colostrum is known to contain immune cells (as lymphocytes) and many antibodies such as IgA, IgG, and IgM. These are some of the components of the adaptive immune system. In preterm infants some IgA may be absorbed through the intestinal epithelium and enter the blood stream though there is very little uptake in full term babies. This is due to the early "closure" of the intestinal epithelium to large molecule uptake in humans unlike the case in cattle which continue to uptake immunoglobulin from milk shortly after birth. Other immune components of colostrum include the major components of the innate immune system, such as lactoferrin, lysozyme, lactoperoxidase, complement, and proline-rich polypeptides (PRP). A number of cytokines (small messenger peptides that control the functioning of the immune system) are found in colostrum as well, including interleukins, tumor necrosis factor, chemokines, and others. Colostrum also contains a number of growth factors, such as insulin-like growth factors I (IGF-1), and II, transforming growth factors alpha, beta 1 and beta 2, fibroblast growth factors, epidermal growth factor, granulocyte-macrophage-stimulating growth factor, platelet-derived growth factor, vascular endothelial growth factor, and colony-stimulating factor-1. Notably in humans a lack of colostrum production is linked to a mutation in the ABCC11 gene that occurs in most people of East Asian descent. This gene is also one the determining factors in wet or dry type earwax, as the mammary glands are a form of apocrine gland. Colostrum is crucial for newborn farm animals. They receive no passive transfer of immunity via the placenta before birth, so any antibodies that they need have to be ingested (unless supplied by injection or other artificial means). The ingested antibodies are absorbed from the intestine of the neonate. The newborn animal must receive colostrum within 6 hours of being born for maximal absorption of colostral antibodies to occur. Recent studies indicate that colostrum should be fed to bovines within the first thirty minutes to maximize IgG absorption rates. Colostrum varies in quality and quantity. In the dairy industry, the quality of colostrum is measured as the amount of IgG (Immunoglobulin G) per liter. It is recommended that newborn calves receive at least 4 quarts (liters) of colostrum with each containing at least 50 grams of IgG/liter. Testing of colostral quality can be done by multitude of devices including colostrometer, optical refractometer or digital refractometer. Mature dairy cattle produce an average of 33 liters of colostrum in the first milking after calving. Livestock breeders commonly bank colostrum from their animals. Colostrum can be stored frozen but it does lose some of its inherent quality. Colostrum produced on a breeder's own premises is considered to be superior to colostrum from other sources, because it is produced by animals already exposed to (and, thus, making antibodies to) pathogens occurring on the premises. A German study reported that multiparous mares produced on average a liter (quart) of colostrum containing 70 grams of IgG. In most dairy cow herds, the calves are separated from their mothers soon after birth and fed colostrum from a bottle. Solidified colostrum in a sweet stall, Salem, Tamil Nadu. Molozyvo – a traditional dish of Ukrainian cuisine. It is a sweet cheese made of cow colostrum. Although many claims of health benefits have been made for colostrum consumption in adults, until recently there have been limited randomized trials to support these assertions. It is probable that little absorption of intact growth factors and antibodies into the bloodstream occurs, due to digestion in the gastrointestinal tract. However, the presence of casein and other buffering proteins does allow growth factors and other bioactive molecules to pass into the lumen of the small intestine intact, where they can stimulate repair and inhibit microbes, working via local effects. This provides a probable mechanism explaining the positive results of colostrum on adult gut health in several recent well controlled published studies. Evidence for the beneficial effect of colostrum on extra-gastrointestinal problems is less well developed, due in part to the limited number of randomised double-blind studies published, although a variety of possible uses have been suggested. Dairy cattle are naturally exposed to pathogens and produce immunoglobulins against them. These antibodies are present in the cow’s bloodstream and in the colostrum. These immunoglobulins are specific to many human pathogens, including Escherichia coli, Cryptosporidium parvum, Shigella flexneri, Salmonella species, Staphylococcus species, and rotavirus (which causes diarrhea in infants). Before the development of antibiotics, colostrum was the main source of immunoglobulins used to fight bacteria. In fact, when Albert Sabin made his first oral vaccine against polio, the immunoglobulin he used came from bovine colostrum. When antibiotics began to appear, interest in colostrum waned, but, now that antibiotic-resistant strains of pathogens have developed, interest is once again returning to natural alternatives to antibiotics, namely, colostrum. The gut plays several important roles including acting as the main pathway for fluid, electrolyte and nutrient absorption while also acting as a barrier to toxic agents present in the gut lumen including acid, digestive enzymes and gut bacteria. It is also a major immunological defence mechanism, detecting natural commensals and triggering immune response when toxic microbes are present. Failure of homeostasis due to trauma, drugs and infectious microbes not only damages the gut but can lead to influx of damaging agents into the bloodstream. These mechanisms have relevance for multiple conditions affecting all areas of the world and socioeconomic groups such as ulcers, inflammation, and infectious diarrhea. There is currently much interest in the potential value of colostrum for the prevention and treatment of these conditions as it is derived from natural sources and can influence damaging factors through multiple pathways including nutritional support, immunological intervention (through its immunoglobulin and other anti-microbial factors) and growth/healing factor constituents. As pointed out by Kelly, inconsistency between results in some published studies may be due in part to variation in dose given and to the timing of the colostrum collection being tested (first milking versus pooled colostrum collected up to day 5 following calving). Some athletes have used colostrum in an attempt to improve their performance, decrease recovery time, and prevent sickness during peak performance levels. Supplementation with bovine colostrum, 20 grams per day (g/d), in combination with exercise training for 8 wk may increase bone-free lean body mass in active men and women. Colostrum also has antioxidant components, such as lactoferrin and hemopexin, which binds free heme in the body. The Isle of Man had a local delicacy called "Groosniuys", a pudding made with colostrum. Hyperimmune colostrum is natural bovine colostrum collected from a population of cows immunized repeatedly with a specific pathogen. The colostrum is collected within 24 hours of the cow giving birth. Antibodies towards the specific pathogens or antigens that were used in the immunization are present in higher levels than in the population before treatment. 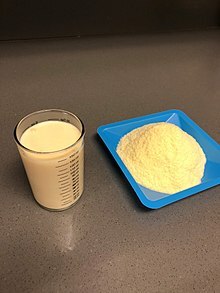 Although some papers have been published stating that specific human pathogens were just as high as in hyperimmune colostrum, and natural colostrum nearly always had higher antibody titers than did the hyperimmune version  clinical trials  have shown that if the immunization is by surface antigens of the bacteria, the Bovine Colostrum Powder  can be used to make tablets capable of binding to the bacteria so that they are excreted in stools. This prevents the successful colonization of the gut, which would otherwise lead to bacteria releasing enterotoxigenic materials. These small immune signaling peptides (PRPs) were independently discovered in colostrum and other sources, such as blood plasma, in the United States, Czechoslovakia and Poland. Hence they appear under various names in the literature, including Colostrinin, CLN, transfer factor and PRP. They function as signal transducing molecules that have the unique effect of modulating the immune system, turning it up when the body comes under attack from pathogens or other disease agents, and damping it when the danger is eliminated or neutralized. At first thought to actually transfer immunity from one immune system to another, it now appears that PRPs simply stimulate cell-mediated immunity. ^ Gottstein, Michael. Colostrum is vital ingredient to keep newborn lambs alive. Irish Independent. 3 March 2009. ^ Ballard, Olivia; Morrow, Ardythe L. (February 2013). "Human Milk Composition: Nutrients and Bioactive Factors". Pediatric Clinics of North America. 60 (1): 49–74. doi:10.1016/j.pcl.2012.10.002. ISSN 0031-3955. PMC 3586783. PMID 23178060. ^ Meyer, A. M., J. J. Reed, T. L. Neville and J. F. Thorson. 2011. Nutritional plane and selenium supply during gestation affect yield and nutrient composition of colostrum and milk in primiparous ewes. USDA Agric. Res. Serv./U. Nebraska, Lincoln. Paper 716. ^ Pearl, J. N.; Edwards, R. A.; Donaldson, E. (1972). "The yield and composition of the milk of Finnish Landrace x Blackface ewes: 1. Ewes and lambs raised indoors". J. Agr. Sci. 79: 303–313. ^ Or-Rashid, M. M.; Fisher, R.; Karrow, N.; AlZahal, O.; McBride, B. W. (2010). "Fatty acid profile of colostrum and milk of ewes supplemented with fish meal and the subsequent plasma fatty acid status of their lambs". J. Anim. Sci. 88 (6): 2092–2102. doi:10.2527/jas.2009-1895. PMID 20154155. ^ Csapo, J.; Stefler, J.; Martin, T. G.; Makray, S.; Sz (1995). "Composition of mares' colostrum and milk. Fat content, fatty acid composition and vitamin content". Int. Dairy J. 5 (4): 393–402. doi:10.1016/0958-6946(94)00008-d.
^ Pikul, J.; Wojtowski, J.; Dankow, R.; Kuckzynsk, B.; Lojek, J. (2008). "Fat content and fatty acids profile of colostrum and milk of primitive Konik horses (Equus caballus gmelini Ant.) during six months of lactation". J. Dairy Res. 75 (3): 302–309. doi:10.1017/s0022029908003336. ^ Zhang, H.; Yao, J.; Zhao, D.; Liu, H.; Li, J. (2005). "Changes in chemical composition of Alxa Bactrian camel milk during lactation". J. Dairy Sci. 88 (10): 3402–3410. doi:10.3168/jds.s0022-0302(05)73024-1. ^ Saint, L.; Smith, M.; Hartmann, P. E. (1984). "The yield and nutrient content of colostrum and milk of women from giving birth to 1 month post-partum". Br. J. Nutr. 52 (1): 87–95. doi:10.1079/bjn19840074. PMID 6743645. ^ Csapo, J.; Martin, T. G.; Csapo-Kiss, Z. S.; Hazas, Z. (1996). "Protein, fats, vitamin and mineral concentration in porcine colostrum and milk from parturition to 60 days". Int. Dairy J. 6 (8–9): 881–892. doi:10.1016/0958-6946(95)00072-0. ^ Quigley, J. D.; III; Drewry, J. J. (1998). "Nutrient and immunity transfer from cow to calf pre- and post-calving". J. Dairy Sci. 81 (10): 2779–2790. doi:10.3168/jds.s0022-0302(98)75836-9. PMID 9812284. ^ "It's Only Natural". 2017-06-09. ^ Bertotto, A; Castellucci, G; Fabietti, G; Scalise, F; Vaccaro, R (1 November 1990). "Lymphocytes bearing the T cell receptor gamma delta in human breast milk". Arch Dis Child. 65 (11): 1274–5. doi:10.1136/adc.65.11.1274-a. PMC 1792611. PMID 2147370. ^ Weaver, L. T.; Wadd, N.; Taylor, C. E.; Greenwell, J.; Toms, G. L. (June 1991). "The ontogeny of serum IgA in the newborn". Pediatric Allergy and Immunology. 2 (2): 72–75. doi:10.1111/j.1399-3038.1991.tb00185.x. ^ Groves, ML (1960). "The isolation of a red protein from milk". Journal of the American Chemical Society. 82 (13): 3345–3360. doi:10.1021/ja01498a029. ^ Paulík S, Slanina L, Polácek M (January 1985). "[Lysozyme in the colostrum and blood of calves and dairy cows]". Vet Med (Praha) (in Slovak). 30 (1): 21–8. PMID 3918380. ^ Reiter B (1978). "The lactoperoxidase-thiocyanate-hydrogen peroxide antibacterium system". Ciba Found. Symp. (65): 285–94. PMID 225143. ^ Brock, JH; et al. (1975). "Bactericidal and hemolytic activity of complement in bovine colostrum and serum: effect of proteolytic enzymes and ethylene glycol tetraacetic acid (EGTA)". Annales d'Immunologie. 126C (4): 439–451. ^ Zabłocka A, Janusz M, Rybka K, Wirkus-Romanowska I, Kupryszewski G, Lisowski J (2001). "Cytokine-inducing activity of a proline-rich polypeptide complex (PRP) from ovine colostrum and its active nonapeptide fragment analogs". Eur. Cytokine Netw. 12 (3): 462–7. PMID 11566627. ^ a b Hagiwara K, Kataoka S, Yamanaka H, Kirisawa R, Iwai H (October 2000). "Detection of cytokines in bovine colostrum". Vet. Immunol. Immunopathol. 76 (3–4): 183–90. doi:10.1016/S0165-2427(00)00213-0. PMID 11044552. ^ Rudloff HE, Schmalstieg FC, Mushtaha AA, Palkowetz KH, Liu SK, Goldman AS (January 1992). "Tumor necrosis factor-alpha in human milk". Pediatr. Res. 31 (1): 29–33. doi:10.1203/00006450-199201000-00005. PMID 1375729. ^ Maheshwari A, Christensen RD, Calhoun DA (November 2003). "ELR+ CXC chemokines in human milk". Cytokine. 24 (3): 91–102. doi:10.1016/j.cyto.2003.07.002. PMID 14581003. ^ Xu RJ (1996). "Development of the newborn GI tract and its relation to colostrum/milk intake: a review". Reprod. Fertil. Dev. 8 (1): 35–48. doi:10.1071/RD9960035. PMID 8713721. ^ O'Dell SD, Day IN (July 1998). "Insulin-like growth factor II (IGF-II)". Int. J. Biochem. Cell Biol. 30 (7): 767–71. doi:10.1016/S1357-2725(98)00048-X. PMID 9722981. ^ Okada M, Ohmura E, Kamiya Y, et al. (1991). "Transforming growth factor (TGF)-alpha in human milk". Life Sci. 48 (12): 1151–6. doi:10.1016/0024-3205(91)90452-H. PMID 2002746. ^ Saito S, Yoshida M, Ichijo M, Ishizaka S, Tsujii T (October 1993). "Transforming growth factor-beta (TGF-beta) in human milk". Clin. Exp. Immunol. 94 (1): 220–4. doi:10.1111/j.1365-2249.1993.tb06004.x. PMC 1534356. PMID 8403511. ^ Tokuyama Y, Tokuyama H (February 1993). "Purification and identification of TGF-beta 2-related growth factor from bovine colostrum". J. Dairy Res. 60 (1): 99–109. doi:10.1017/S0022029900027382. PMID 8436667. ^ Hironaka, T; et al. (1997). "Identification and partial purification of a basic fibroblast growth factor-like growth factor derived from bovine colostrum". Journal of Dairy Science. 80 (3): 488–495. doi:10.3168/jds.s0022-0302(97)75961-7. PMID 9098798. ^ Xiao X, Xiong A, Chen X, Mao X, Zhou X (March 2002). "Epidermal growth factor concentrations in human milk, cow's milk and cow's milk-based infant formulas". Chin. Med. J. 115 (3): 451–4. PMID 11940387. ^ a b Playford RJ, Macdonald CE, Johnson WS (July 2000). "Colostrum and milk-derived peptide growth factors for the treatment of gastrointestinal disorders". Am. J. Clin. Nutr. 72 (1): 5–14. doi:10.1093/ajcn/72.1.5. PMID 10871554. ^ Vuorela P, Andersson S, Carpén O, Ylikorkala O, Halmesmäki E (November 2000). "Unbound vascular endothelial growth factor and its receptors in breast, human milk, and newborn intestine". Am. J. Clin. Nutr. 72 (5): 1196–201. doi:10.1093/ajcn/72.5.1196. PMID 11063449. ^ Flidel-Rimon O, Roth P (November 1997). "Effects of milk-borne colony stimulating factor-1 on circulating growth factor levels in the newborn infant". J. Pediatr. 131 (5): 748–50. doi:10.1016/S0022-3476(97)70105-7. PMID 9403658. ^ Miura, Kiyonori; Yoshiura, Koh-ichiro; Miura, Shoko; Shimada, Takako; Yamasaki, Kentaro; Yoshida, Atsushi; Nakayama, Daisuke; Shibata, Yoshisada; Niikawa, Norio (2007-06-01). "A strong association between human earwax-type and apocrine colostrum secretion from the mammary gland". Human Genetics. 121 (5): 631–633. doi:10.1007/s00439-007-0356-9. ISSN 0340-6717. PMID 17394018. ^ Balfour, W. E.; Comline, R. S. (1962). "Acceleration of the absorption of unchanged globulins in the new-born calf by factors in colostrum". J. Physiol. 160 (2): 234–257. doi:10.1113/jphysiol.1962.sp006844. PMC 1359530. PMID 16992118. ^ Bush, L. J.; Staley, T. E. (1980). "Absorption of colostral immunoglobulins in newborn calves". J. Dairy Sci. 63 (4): 672–680. doi:10.3168/jds.s0022-0302(80)82989-4. PMID 6991559. ^ Staley, T. E.; Bush, L. J. (1985). "Receptor mechanisms of the neonatal intestine and their relationship to immunoglobulin absorption and disease". J. Dairy Sci. 68 (1): 184–205. doi:10.3168/jds.s0022-0302(85)80812-2. PMID 3884680. ^ Jensen, A. R.; Elnif, J.; Burrin, D. G.; Sangild, P. T. (2001). "Development of intestinal immunoglobulins absorption and enzyme activities in neonatal pigs is diet dependent". J. Nutr. 131: 3259–3265. ^ Sawyer, M.; Willadsen, C. H.; Osburn, B. I.; McGuire, T. C. (1977). "Passive transfer of colostral immunoglobulins from ewe to lamb and its influence on neonatal lamb mortality". J. Am. Vet. Med. Assoc. 171: 1255–1259. ^ Pakkanen R, Aalto J.; Aalto (1997). "Growth Factors and Antimicrobial Factors of Bovine Colostrum". International Dairy Journal. 7 (5): 285–297. doi:10.1016/S0958-6946(97)00022-8. ^ Devery-Pocius, J.E. ; et al. (1983). "Age and Previous Lactations as Factors in the Amount of Bovine Colostral Immunoglobulins1". Journal of Dairy Science. 66 (2): 221–226. doi:10.3168/jds.S0022-0302(83)81780-9. PMID 6833597. ^ Venner M, Markus RG, Strutzberg-Minder K, Nogai K, Beyerbach M, Klug E (2008). "[Evaluation of immunoglobulin G concentration in colostrum of mares by ELISA, refractometry and colostrometry]". Berliner und Münchener Tierärztliche Wochenschrift (in German). 121 (1–2): 66–72. PMID 18277781. ^ Playford, R. J.; Woodman, A. C.; Clark, P.; Watanapa, P.; Vesey, D.; Deprez, P. H.; Williamson, R. C.; Calam, J. (1993-04-03). "Effect of luminal growth factor preservation on intestinal growth". Lancet. 341 (8849): 843–848. ISSN 0140-6736. PMID 8096559. ^ Davison, Glen; Marchbank, Tania; March, Daniel S.; Thatcher, Rhys; Playford, Raymond J. (1 August 2016). "Zinc carnosine works with bovine colostrum in truncating heavy exercise-induced increase in gut permeability in healthy volunteers". The American Journal of Clinical Nutrition. 104 (2): 526–536. doi:10.3945/ajcn.116.134403. ISSN 1938-3207. PMID 27357095. ^ Marchbank, Tania; Davison, Glen; Oakes, Jemma R.; Ghatei, Mohammad A.; Patterson, Michael; Moyer, Mary Pat; Playford, Raymond J. (1 March 2011). "The nutriceutical bovine colostrum truncates the increase in gut permeability caused by heavy exercise in athletes". American Journal of Physiology. Gastrointestinal and Liver Physiology. 300 (3): G477–484. doi:10.1152/ajpgi.00281.2010. ISSN 1522-1547. PMID 21148400. ^ Playford, R. J.; MacDonald, C. E.; Calnan, D. P.; Floyd, D. N.; Podas, T.; Johnson, W.; Wicks, A. C.; Bashir, O.; Marchbank, T. (1 June 2001). "Co-administration of the health food supplement, bovine colostrum, reduces the acute non-steroidal anti-inflammatory drug-induced increase in intestinal permeability". Clinical Science (London, England: 1979). 100 (6): 627–633. ISSN 0143-5221. PMID 11352778. ^ Khan, Z.; Macdonald, C.; Wicks, A. C.; Holt, M. P.; Floyd, D.; Ghosh, S.; Wright, N. A.; Playford, R. J. (1 November 2002). "Use of the 'nutriceutical', bovine colostrum, for the treatment of distal colitis: results from an initial study". Alimentary Pharmacology & Therapeutics. 16 (11): 1917–1922. ISSN 0269-2813. PMID 12390100. ^ Uruakpa, F; Ismond, M.A.H; Akobundu, E.N.T (2002). "Colostrum and its benefits: a review". Nutrition Research. 22 (6): 755–767. doi:10.1016/S0271-5317(02)00373-1. ^ Playford, RJ. ; Floyd, DN. ; Macdonald, CE. ; Calnan, DP. ; Adenekan, RO. ; Johnson, W.; Goodlad, RA. ; Marchbank, T. (May 1999). "Bovine colostrum is a health food supplement which prevents NSAID induced gut damage". Gut. 44 (5): 653–8. doi:10.1136/gut.44.5.653. PMC 1727496. PMID 10205201. ^ Carver, JD. ; Barness, LA. (June 1996). "Trophic factors for the gastrointestinal tract". Clin Perinatol. 23 (2): 265–85. PMID 8780905. ^ a b McConnell, M. A.; Buchan, G.; Borissenko, M. V.; Brooks, H. J. L. (2001). "A comparison of IgG and IgG1 activity in an early milk concentrate from non-immunised cows and a milk from hyperimmunised animals". Food Research International. 34 (2–3): 255–261. doi:10.1016/S0963-9969(00)00163-0. ^ SABIN, AB. (November 1950). "Antipoliomyelitic substance in milk of human beings and certain cows". AMA Am J Dis Child. 80 (5): 866–7. PMID 14777169. ^ Pallasch, TJ. (October 2003). "Antibiotic prophylaxis: problems in paradise". Dent Clin North Am. 47 (4): 665–79. doi:10.1016/S0011-8532(03)00037-5. PMID 14664458. ^ Baumgart, Daniel C.; Dignass, Axel U. (1 November 2002). "Intestinal barrier function". Current Opinion in Clinical Nutrition and Metabolic Care. 5 (6): 685–694. doi:10.1097/01.mco.0000038813.16540.3b (inactive 2019-02-02). ISSN 1363-1950. PMID 12394645. ^ Playford, R. J.; Macdonald, C. E.; Johnson, W. S. (1 July 2000). "Colostrum and milk-derived peptide growth factors for the treatment of gastrointestinal disorders". The American Journal of Clinical Nutrition. 72 (1): 5–14. doi:10.1093/ajcn/72.1.5. ISSN 0002-9165. PMID 10871554. ^ Kelly, Gregory S. (1 November 2003). "Bovine colostrums: a review of clinical uses". Alternative Medicine Review: A Journal of Clinical Therapeutic. 8 (4): 378–394. ISSN 1089-5159. PMID 14653766. ^ a b Hofman, Z.; Smeets, R.; Verlaan, G.; Lugt, R.; Verstappen, PA. (December 2002). "The effect of bovine colostrum supplementation on exercise performance in elite field hockey players". Int J Sport Nutr Exerc Metab. 12 (4): 461–9. PMID 12500989. ^ Buckley, JD. ; Abbott, MJ. ; Brinkworth, GD. ; Whyte, PB. (June 2002). "Bovine colostrum supplementation during endurance running training improves recovery, but not performance". J Sci Med Sport. 5 (2): 65–79. doi:10.1016/S1440-2440(02)80028-7. PMID 12188088. ^ Ray Playford et al. (2011). The nutriceutical, bovine colostrum, truncates the increase in gut permeability caused by heavy exercise in athletes. American Journal of Physiology. Gastrointestinal and Liver Physiology, (March 2011). ^ Berk, LS. ; Nieman, DC. ; Youngberg, WS. ; Arabatzis, K.; Simpson-Westerberg, M.; Lee, JW. ; Tan, SA. ; Eby, WC. (April 1990). "The effect of long endurance running on natural killer cells in marathoners". Med Sci Sports Exerc. 22 (2): 207–12. PMID 2355818. ^ Antonio, J.; Sanders, MS.; Van Gammeren, D. (March 2001). "The effects of bovine colostrum supplementation on body composition and exercise performance in active men and women". Nutrition. 17 (3): 243–7. doi:10.1016/S0899-9007(00)00552-9. PMID 11312068. ^ Arai, Y.; Hirose, N.; Yamamura, K.; Shimizu, K.; Takayama, M.; Ebihara, Y.; Osono, Y. (February 2001). "Serum insulin-like growth factor-1 in centenarians: implications of IGF-1 as a rapid turnover protein". J Gerontol A Biol Sci Med Sci. 56 (2): M79–82. doi:10.1093/gerona/56.2.M79. PMID 11213280. ^ Caregaro, L.; Favaro, A.; Santonastaso, P.; Alberino, F.; Di Pascoli, L.; Nardi, M.; Favaro, S.; Gatta, A. (June 2001). "Insulin-like growth factor 1 (IGF-1), a nutritional marker in patients with eating disorders". Clin Nutr. 20 (3): 251–7. doi:10.1054/clnu.2001.0397. PMID 11407872. ^ Rasmussen, MH. ; Frystyk, J.; Andersen, T.; Breum, L.; Christiansen, JS. ; Hilsted, J. (March 1994). "The impact of obesity, fat distribution, and energy restriction on insulin-like growth factor-1 (IGF-1), IGF-binding protein-3, insulin, and growth hormone". Metabolism. 43 (3): 315–9. doi:10.1016/0026-0495(94)90099-X. PMID 7511202. ^ Mero, A.; Kähkönen, J.; Nykänen, T.; et al. (August 2002). "IGF-I, IgA, and IgG responses to bovine colostrum supplementation during training". J Appl Physiol. 93 (2): 732–9. doi:10.1152/japplphysiol.00002.2002. PMID 12133885. ^ Duff, Whitney R. D.; Chilibeck, Philip D.; Rooke, Julianne J.; Kaviani, Mojtaba; Krentz, Joel R.; Haines, Deborah M. (June 2014). "The effect of bovine colostrum supplementation in older adults during resistance training". International Journal of Sport Nutrition and Exercise Metabolism. 24 (3): 276–285. doi:10.1123/ijsnem.2013-0182. ISSN 1543-2742. PMID 24281841. ^ Wakabayashi, H.; Matsumoto, H.; Hashimoto, K.; Teraguchi, S.; Takase, M.; Hayasawa, H. (May 1999). "Inhibition of iron/ascorbate-induced lipid peroxidation by an N-terminal peptide of bovine lactoferrin and its acylated derivatives" (PDF). Biosci Biotechnol Biochem. 63 (5): 955–7. doi:10.1271/bbb.63.955. PMID 10380640. ^ Gutteridge, JM. ; Smith, A. (December 1988). "Antioxidant protection by haemopexin of haem-stimulated lipid peroxidation". Biochem J. 256 (3): 861–5. PMC 1135495. PMID 3223958. ^ "Cooking and Food" (PDF). Manx Farming and Country Life. 9. 1991. ^ Lawrence HS (August 1949). "The cellular transfer of cutaneous hypersensitivity to tuberculin in man". Proc. Soc. Exp. Biol. Med. 71 (4): 516–22. doi:10.3181/00379727-71-17242. PMID 18139800. ^ Janusz M, Lisowski J, Franĕk F (December 1974). "Isolation and characterization of a proline-rich polypeptide from ovine colostrum". FEBS Lett. 49 (2): 276–9. doi:10.1016/0014-5793(74)80529-6. PMID 4442608. ^ Zimecki M (2008). A proline-rich polypeptide from ovine colostrum: colostrinin with immunomodulatory activity. Adv. Exp. Med. Biol. Advances in Experimental Medicine and Biology. 606. pp. 241–50. doi:10.1007/978-0-387-74087-4_9. ISBN 978-0-387-74086-7. PMID 18183932. ^ Levin AS, Spitler, Fudenberg (1975). "Transfer factor I: methods of therapy". Birth Defects Orig. Artic. Ser. 11 (1): 445–8. PMID 1080060.